448 pages | 27 B/W Illus. 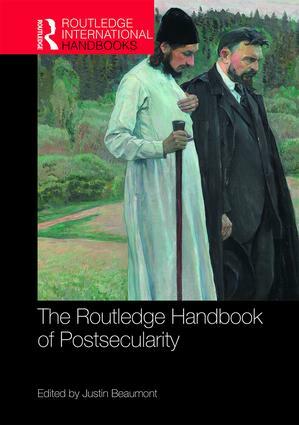 The Routledge Handbook of Postsecularity offers an internationally significant and comprehensive interdisciplinary collection which provides a series of critical reviews of the current state of the art and future trends in philosophical, theoretical, and conceptual terms. The volume likewise presents a range of empirical knowledges and engagements with postsecularity. A critical yet sympathetic dialogue across disciplinary divides in an international context ensures that the volume covers a wide and interrelated intellectual and geographical scope. The editor’s introduction with Klaus Eder offers a robust foundation for the volume, setting out the central aims and objectives, the rationale for the contributions, and an outline of the structure. Thorny issues of normativity and empirical challenges are highlighted for the reader. The handbook comprises four interrelated sections. Part I: Philosophical meditations discusses postsecularity from philosophical standpoints, and Part II: Theological perspectives presents contributions from a variety of theological viewpoints. Part III: Theory, space, social relations contains pieces from geography, planning, sociology, and religious studies that delve into theoretically informed empirical implications of postsecularity. Part IV: Political and social engagement offers chapters that emphasize the political and social implications of the debate. In the Afterword, Eduardo Mendieta joins the editor toreflect on the notion of reflexive secularization across the volume as a whole, alluding to new lines of inquiry. The handbook is an invaluable guide for graduate and advanced undergraduate teaching, and a key reference for students and scholars of human geography, sociology, political science, applied philosophy, urban and public theology, planning, and urban studies. 2: Beyond belief: religion as the "dynamite of the people"
Justin Beaumont is Honorary Research Fellow at the School of Geography, Queen Mary University of London, UK.